Like the community namesake, elegant tranquility best describes this lovely move-in ready home! Just shy of 1/2 an acre, it’s located on an elevated, north/south facing, corner lot w/magnificent views of Black Mountain & Elephant Butte. Offering single level, spacious great room floor plan w/gourmet kitchen, the home is perfect for entertaining. Engineered Hickory, diagonally set tile, gas fireplace w/stacked travertine, the carefully chosen, rich finishes & neutral palette compliment any decor. Split 3 bed/3 full baths ensure privacy, w/the master suite offering his/her’s closets, large glass shower & soaking tub. Carefree living is at it’s best in this, very private, backyard oasis w/stunning views, gorgeous pool, waterfall, travertine pavers, sun deck, & outdoor shower. A Must See! Directions: East/Right on Cave Creek Rd. North/Left on Tranquil Trl. First Right on Verde Vista Trl. Through Gate & Left on Verde Vista Trl. Right on Winding Wash Trl. Follow Rd to Cul De Sac, Home is on Rt. Approximate size: 18386.00 sq. ft. Please, send me more information on this property: MLS# 5877291 – $869,000 – 37030 N Winding Wash Trail, Carefree, AZ 85377. 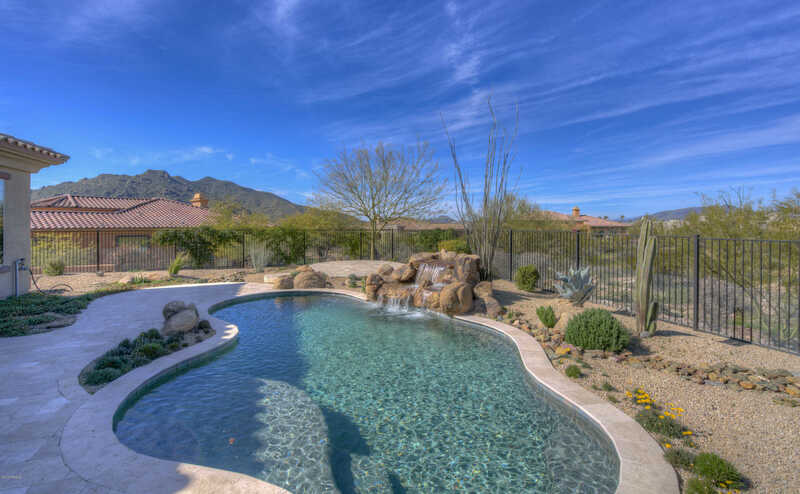 I would like to schedule a private showing for this property: MLS# 5877291 – $869,000 – 37030 N Winding Wash Trail, Carefree, AZ 85377.